Whispers in the Loggia: In Scotland, "The Ultimatum"
On Scotland's "Day for Life" -- held annually on this feast of the Visitation -- Cardinal Keith O'Brien of St Andrew's and Edinburgh issued the strongest statement yet by a top-shelf prelate urging pro-choice politicians to refrain from receiving the Eucharist. The remarks came during a noonday Mass to mark the pro-life observance at the Scottish capital's St Mary's Cathedral. 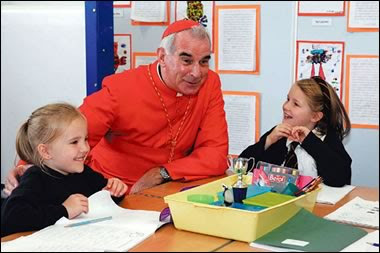 Saying that "the killing is beyond our grasp," the cardinal noted that "in Scotland we kill the equivalent of a classroom full of school children every day. "As a society we wilfully ignore these realities," he said. In the political community, O'Brien emphasized that "I speak most especially to those who claim to be Catholic.... I remind them to avoid cooperating in the unspeakable crime of abortion and the barrier such cooperation erects to receiving Holy Communion." The Scottish primate's call follows last month's comments from Pope Benedict aboard the papal plane to Brazil, in which the pontiff voiced his support for bishops willing to deny Communion to politicians who advocate open access to abortion in defiance of church teaching. Simon Dames, a spokesman for the Scottish hierarchy provided a summation of O'Brien's stance during an interview with the BBC. "When it comes to the abortion issue," Dames said, "do not promote it, do not support it -- and if you do, we're talking about refusing the Eucharist. You're excluding yourself from the Catholic church." Amid perceptions of liberalism in some of his prior statements, O'Brien was compelled to make a public Profession of Faith before his 2003 elevation to the cardinalate. In a recent edition of The Tablet, the cardinal wrote of a visit to India, where he reflected on elements of Gandhi's teaching of satyagraha (non-violence) and Paul VI's encyclical on the development of peoples Populorum Progressio, which marks its 40th anniversary this year.